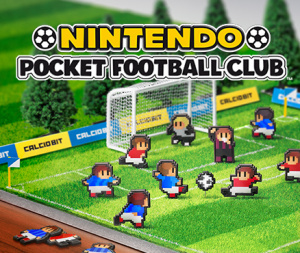 During yesterday's Nintendo Direct broadcast, Nintendo of Europe President Satoru Shibata confirmed that Nintendo Pocket Football Club will arrive on 17th April. It's a title that was shown last year, and brings a rather light-hearted approach to the football management sim genre; don't expect head-scratching Football Manager-style depth here. It does look charming, however, as you work to recruit and train players for your team before watching a match unfold. Training utilises a power-up card system, while there'll be both StreetPass and SpotPass options to play and trade with others; there'll also be a website where you can log in and check detailed stats on your team and others. Nintendo of Europe has also celebrated the announcement of a release date with an Iwata Asks article, in which the game's lead Hiroyuke Sonobi explains in more detail how the title utilises the communication capabilities of the 3DS, well beyond what was possible in the Game Boy Advance original. Iwata: On Game Boy Advance, the only way you could create a network was by using the Link Cable. But on Nintendo 3DS, you have both StreetPass and SpotPass, and this means that the range of network options available has increased dramatically. Sonobe: That’s right, and that’s the single aspect of the game I spent most time thinking about. I wanted to come up with the best ways to utilise this functionality and enhance the game. Iwata: Developing the game for Nintendo 3DS meant that it wouldn’t just be computer-generated teams you’d be playing against, but also teams trained up by other players. This adds to the fun of watching games, doesn’t it? Sonobe: Yes, it does. Also, if you’ve already transferred the data ahead of time, there’s no need for real time connectivity between players. Iwata: So you don’t have to wait for a convenient time for the other player. You can enjoy playing a match whenever you like. Sonobe: Exactly. In Derby Stallion, there was something called the Breeders’ Cup where you could race against horses reared by other players, and that proved to be really exciting. That’s why I was keen to do something similar with Nintendo Pocket Football Club. There is a single-player League structure, too, and it's explained that achieving better objectives is only possible when taking on tougher opponents, encouraging a balance between playing weaker teams for experience and stepping up. It's also mandatory to watch the games, to encourage players to closely watch how their team is progressing — matches will take around eight minutes. As Sonobe-san focuses on details to a great degree, it emerged that this project was six years in the making, with the bulk of the work being in the mechanics if not the charming but simple visuals. As always we recommend checking out the whole Iwata Asks article for details. How many of you in Europe are looking forward to this one? But I'm also mainly a gamer. I don't really dig football games since the old N64 ISS days. But this looks really, really good. It looks like it could offer tons of replay value. Hope the Streetpass works well!!!! I will definitely get this. I'm a big fan of Football Manager so while this won't offer anywhere near the depth, it'll still be a great portable, fun title. Looks like a copy of Pocket League story. Still, it it has some good network features in and isn't too expensive, might give it a try. the game looks really good ! WTF you guys?!!! All the games we get from our beloved Nintendo is shovelware like that and you're all feeling happy. No surprise many are fleeing Nintendo boat. Couple more Nintendo Directs like the one yesterday and i'll be out of it no doubt. I had given up on ever be able to play Calciobit, I'm really glad this is coming. I'm not the biggest fan of football and much less football managing simulations, but I will make an exception for this one. Looks interesting might get it depending on reviews. yess i want this game am buying first day. @DarkAngel_17 so donkey kong and x are shovelware titles in your opinion? I have no interest in soccer but this looks really fun. Seems to have depth to the strategic side of the game & the graphical style is pretty haha. UK ONLY?! Im done with them now. @andreoni79 if they ask more than, say, 8.99€ then they deserve to go bankrupt! @andreoni79 yeah the bad news is that nowdays there are similar kind of experiences offered on mobile phones for 3€ - even if not as deep, they are always 3€. They can't possibly think they can get away with five times the price. I've never been a big fan of football games with the exceptions of World Cup '98 and Premier Manager 98/99 (Won both of them in Chelsea official magazine! ), but this could break my 10 year streak of not playing them. It combines RPG elements with football which sounds pretty fun and Level 5 are boss, I own every one of their GUILD games and like the lot. The Pro Evolution Soccer 2013 for the 3DS is great fun. (And it was getting better each release. However it was consistently outsold by the exact same Fifa from 2012 with just names changed so you can see why they stopped bothering). I hate soccer, but that actually looks great. Hopefully this will see a US eShop release, as well? Why can't we get something like this but baseball or football (American version) in the U.S.? I'd settle for soccer, but still, why don't we get anything like this? Sports offerings are so sparse on Nintendo consoles it's ridiculous. @statnut I was going to say the exact same thing. I would love a Pocket Baseball Club or Pocket (American) Football Club in this exact style. Hopefully NOA sees the potential and makes a push for this. The fact that they're bringing over Rusty's Real Deal Baseball is a good sign they're willing to localize odd, non-sim sports games to the west. At the very least, I'd be interested in this games coming out in North America, too, even though I'd never play a FIFA-style game. Am a big football fan and loved various games in the football manager series, but for some reason I think this looks terrible: I don't imagine it will have much in the way of depth, obviously no licensing and I imagine growing tired of having to watch all of my games for 8 minutes pretty quickly. Will try to reserve judgement until I see some reviews though I guess. Really hoping this will be a good one. The premise sounds great. A good football manager game is always welcome on 3DS. I'd spend two euros on this one, even just out of curiosity. No way I'd pay any more than that.